The dwarf plantain is a small herb with white-clustered flowers on the end of a short, light green stalk. It grows well in serpentine, sandy, and clay soils as well as on hillsides and in meadows. The dwarf plantain is especially important as the host plant of the threatened Bay checkerspot butterfly. You can find them in Coyote Ridge, Coyote Valley, and Rancho Cañada Del Oro open space preserves in the spring months. 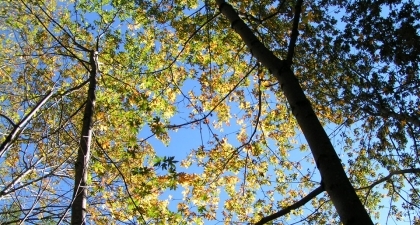 Western sycamores are found from north of the Bay Area to Baja California, primarily in or near the coast range. It is a tall tree and can extend more than 70-feet high. Its bark is mottled grey, white, and tan and branches extend at erratic angles. It needs more water than other trees, so it is commonly found beside creeks or wetlands. A good place for viewing is Rancho Cañada del Oro Open Space Preserve. In April, its small reddish flowers appear. Interestingly, each tree has both male and female flowers. The female flowers mature into distinctive spiny ball-like fruits. The California Buckeye is a native tree that grows in canyons, along riverbanks and streams, and on dry slopes. This species is known for its large, orange-brown seeds. Squirrels are the only wildlife that eat buckeye seeds, as they are toxic for every other animal. In the spring, the California Buckeye produces many spikes of frilly white flowers that grow in clusters. Unlike the seeds that are toxic, these flowers attract bees and butterflies, and its tender, dark green leaves are eaten by many species of wildlife and livestock. The California bay laurel is an evergreen tree native to the coastal forests of our state, although they can occupy a diverse range of habitats. Its leaves are smooth, long, oblong shapes that give off a peppery smell when crushed. In the late winter and early spring, they produce tiny white or yellow flowers. Deer especially use its leaves and twigs for food, although many other species of mammals and birds use these trees for shelter and nesting. 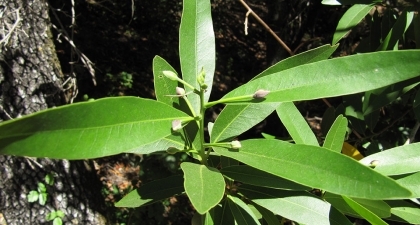 California bay laurels can be found as either small shrubs or tall trees that grow between 20 and 60 feet tall. The Bigberry manzanita is a large shrub or small tree with green-grey, oval leaves and shiny, mahogany-colored bark that is smooth to the touch. This evergreen plant is extremely drought tolerant, and looks green even during hot, dry, California summers. In the winter and early spring, it produces bunches of small, white, bell-shaped flowers that droop downwards in clusters. These flowers provide nectar for hummingbirds, butterflies, and bees. You can find this plant at the Rancho Cañada del Oro Open Space Preserve. This native tree gets its name from its huge, 5-lobed leaves that are 7-14 inches in diameter! Bigleaf Maple leaves are smooth and lush green on the surface with a paler green color underneath. If autumn temperatures get cold enough, the leaves turn a reddish yellow before dropping off for the winter. The trees themselves grow from 25 to 80 feet tall. The tree’s seeds provide food for rodents and birds, while elk and deer eat the leaves, twigs, and saplings. 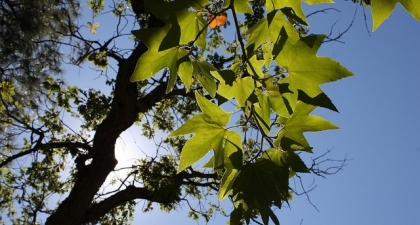 You can most likely find Bigleaf Maples on Open Space Authority preserves near streams and creeks. 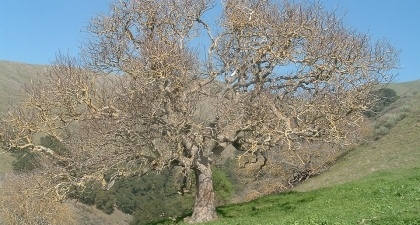 Coast live oak is one of several species of native oaks found in the Santa Clara Valley. They can grow more than 40 feet tall with thick horizontal branches. The curled leaves are a dark, waxy green, with small barbs; The flip side has gray or golden fuzz. Their acorns — which are about 2 inches long and smooth — feed a variety of birds such as woodpeckers and scrub jays and mammals including deer and squirrels. Their thick bark provides some protection from fires. 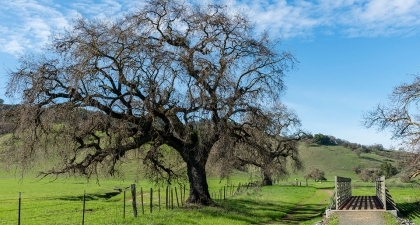 Coast live oak trees are found from Mendocino County to Mexico along the coast range, where they receive more precipitation than farther inland. They are found in all Santa Clara Valley Open Space Authority preserves. Coyote brush is a common chaparral or coastal scrub plant, found through parts of California, Oregon, New Mexico and northern Mexico. One plant is rarely found growing alone, as you’ll see if you visit Coyote Valley or Rancho Cañada del Oro open space preserves. It is an evergreen shrub (keeps its leaves all year) that usually grows 3 to 6 feet high. It has small creamy white flowers that blossom between September and November. They attract a variety of insects including wasps, butterflies, and bees. It provides cover for a variety of small mammals such as rabbits and birds. Although coyote brush is resilient, much of its habitat has been affected by agriculture and urban development. 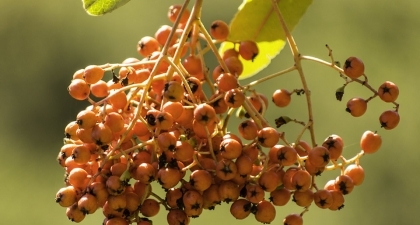 Elderberry is a native shrub that is a key source of food — and vitamin C — for deer, squirrels, the western bluebird, Steller’s jay and a variety of other wildlife. It has bright green, elongated and serrated leaves and cream-colored hand-sized clusters of blossoms, which appear in the spring. Its berries form tight clusters and are only edible when they ripen and turn blue. Native Americans dried ripe elderberries and cooked them into a sauce. The berries were also used as a dye, as medicine and the wood was made into baskets, arrows, and musical instruments. 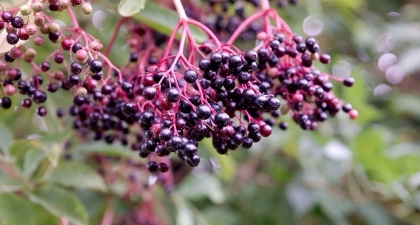 Elderberry is found on sunny sites near waterways throughout the western United States including in Sierra Vista and Rancho Cañada del Oro open space preserves. “Leaves of three, let it be!” Pacific poison oak is a native shrub or vine that grows in forests, woodlands, and grasslands. It belongs to the same family as poison ivy and poison sumac, which are found in other parts of the United States. 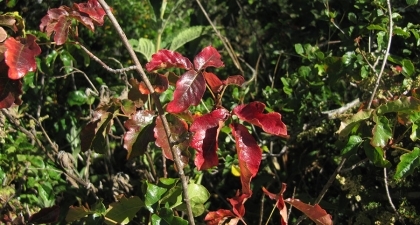 You can spot poison oak by its glossy leaflets that grow in threes and may be green or red, depending on the season. With muted green leaves, sagebrush is a widespread chaparral plant (or shrub plant) in the Santa Clara Valley and is particularly prominent in the Sierra Vista Open Space Preserve. 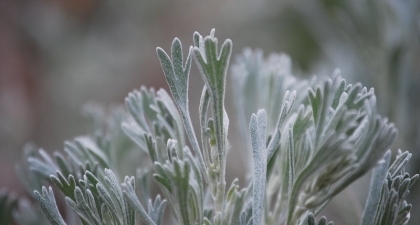 If you think you spy sagebrush but aren’t sure, rub its soft, thread-like leaves gently – it has a distinctive aroma made by a chemical that is thought to keep other plants from sprouting too close. That same chemical also makes it a highly flammable plant. Sagebrush supports many birds and mammals including sparrows and rabbits. It is found from the North Bay to Mexico along the coast range. 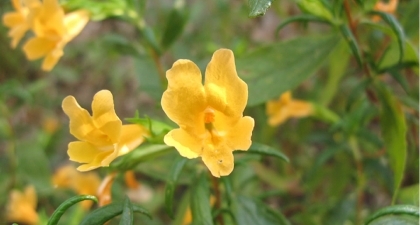 Its small, pale yellow flowers appear in the late summer or fall. It has thin, shallow roots, which can capture early winter rains to grow quickly. With its distinctive red berries and dark green serrated leaves, toyon is easiest to identify in the winter, when many other plants have lost their leaves. The berries are favorite foods of birds including the California quail and the band-tailed pigeon. 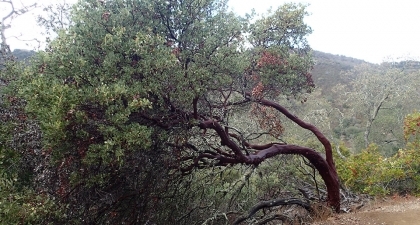 A shrub that is usually more than 4 feet high, toyon is found throughout California’s coast range and Sierra foothills, south to Baja California, and in all of Santa Clara Valley Open Space Authority’s preserves. It has an extensive root system, which helps it survive long periods of drought and on unstable slopes. In the late summer, white blossoms appear, which are visited by native bees. The largest of all North American oaks, the Valley Oak can grow up to 100 feet tall. To survive, these trees need the Mediterranean climate of the Santa Clara Valley, where winters are wet and mild, and summers are hot and dry. A true California native, they are resistant to drought. Valley Oaks are deciduous trees; you will see their leaves turn brownish-yellow in the autumn and then fall off. 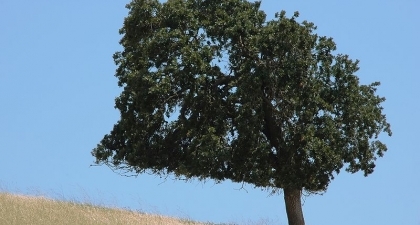 Valley Oaks are essential to the Santa Clara Valley ecosystem. Their giant branches and trunks house many species of wildlife, such as birds, rodents, and bats. Ground squirrels, black-tailed deer, yellow-billed magpies, and many other animals eat their acorns. Named the California state grass in 2004, purple needlegrass is a key component of native grasslands. It is found along the California coast and in parts of the Sacramento Valley and the Sierra Nevada foothills. It’s prominent along the Llagas Creek Loop Trail in Rancho Cañada del Oro Open Space Preserve, where a prescribed burn about a decade ago helped support a native grassland. 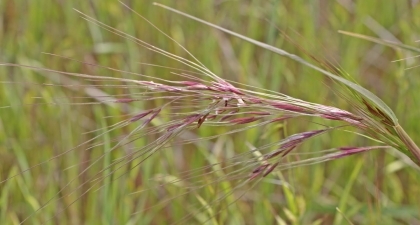 A perennial (which survives more than one year), purple needlegrass grows in bunches. It can out compete some invasive annual plants and tolerate a variety of soil types, including serpentine and clay soils. The fruit (which holds the seed) is purple when young and connected to a long, twisting appendage called an awn, which helps the seed bury into the soil to germinate. The bright orange or yellow blooms of the California poppy are one of the first signs of spring in the Santa Clara Valley. 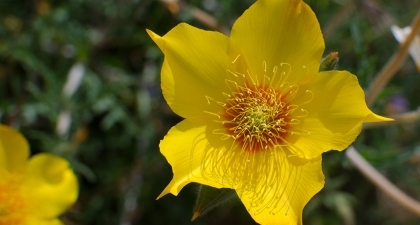 It beat out the mariposa lily and the Matilija poppy, to become the state flower in 1903. 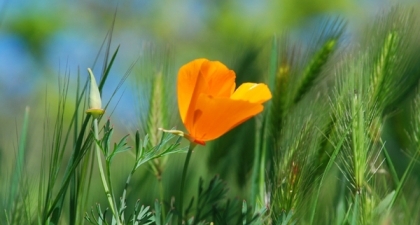 California poppies are found in a variety of sun-exposed, grassy habitats throughout the western United States including in Coyote Ridge and Rancho Cañada del Oro open space preserves. The petals (there are four) close at night or on cloudy days. Early Spanish travelers called the plant “copa del ora” or “cup of gold.” When it was introduced in other countries with similar, Mediterranean climates such as Chile and Australia, California poppies spread widely. Blazing star is a cheerful-looking wildflower that blooms in late spring. It grows well along rocky outcroppings, such as along the trails in Sierra Vista Open Space Preserve. Its flowers consist of five bright yellow petals surrounding centers full of stamen. One plant can grow up to a little over a foot tall and produce many flowers, which open in the afternoon sun. The most beautiful jewelflower is a rare species of wildflower only found in California. These plants are thin and pale green with bristly bases and able to grow up to 3 feet tall. The white and lavender urn-shaped flowers alternate every inch from the end of the stem and have frilly-edged petals. 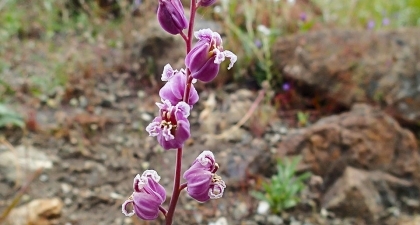 The jewelflower’s adaptation to serpentine soils means you may be lucky enough to find it in Coyote Ridge or Rancho Cañada del Oro open space preserves, blooming from April through June. 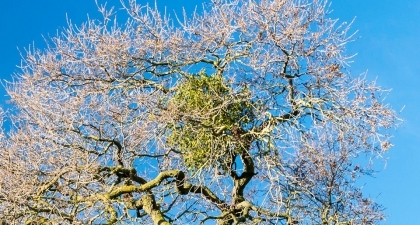 The native Pacific Mistletoe, also known as Oak Mistletoe, is a semi-parasitic plant. While it can photosynthesize like a normal plant, it has no true ground roots. Instead, mistletoe relies on attaching itself to another plant with tube-like “roots” that it uses to take the host plant’s mineral nutrients and water for itself. This causes the host plant to stop growing, eventually killing it. While it may seem as though mistletoe only exists to harm the environment, this plant provides many benefits. Its white berries are an important food source for some wildlife, and many species of birds and small mammals use its mass of branches to hide and nest in. Lupine, a spring wildflower, is present in all of Santa Clara Valley Open Space Authority’s preserves. As an annual, it blooms in March or April and is often found in extensive patches, mixed with other flowers and grasses. Each shoot sporting purple blossoms can extend 9 or more inches high. Each blossom has a white splotch, which directs insects — and hummingbirds — to the pollen. 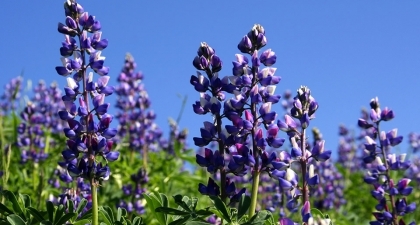 It is found in grasslands and chaparral (shrubs) landscapes along California’s coast range and the Sierra foothills, as well as in parts of Oregon and Nevada, although related species of lupine are found throughout the western United States. 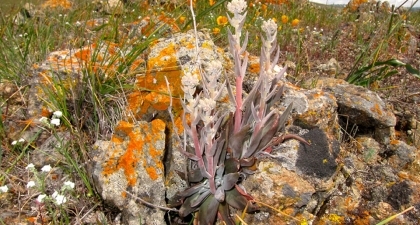 Listed as federally endangered, the Santa Clara Valley dudleya — also known as a “liveforever” or as Dudleya abramsii ssp. Setchellii — depends on the continued existence of rocky, serpentine habitats in the Coyote Valley such as those found in Coyote Ridge Open Space Preserve. Serpentine soil, which contains the greenish rock serpentinite, is low in calcium and high in magnesium and other heavy metals, which allows plants like the dudleya to develop specialized abilities to cope. It is a low-growing succulent, which forms a rosette, or a circular grouping of leaves. 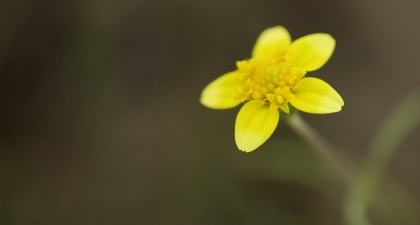 It has milky yellow flowers that bloom in the late spring and summer. 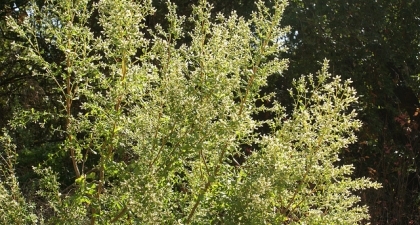 This perennial shrub is found from southern Oregon throughout California’s coast range and Sierra foothills, south into Mexico, and can be spotted in Rancho Cañada del Oro Open Space Preserve. Between April and June, pale orange flowers appear. Look closely and you might spot the “monkey” face that gives the plant its name. The leaves exude a gummy resin thought to protect them from hungry caterpillars, although it is still a host plant for some checkerspot and buckeye butterflies. The blossoms attract hummingbirds, bees, and other insects. If touched by an insect — or blade of grass — the flower will close, preventing self-pollination to ensure its offspring are as healthy as possible. 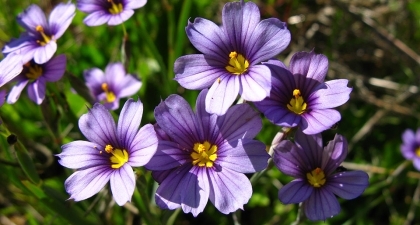 Blue-eyed grass grows throughout California. This plant produces flowers from January to July, but the best time to find them is March through May. Its small, 1-inch flowers have six blueish-purple petals and a yellow center. As the name suggests, blue-eyed grass has thin, grass-like leaves, but is technically not a grass species. It grows well in moisture and can be found in open, grassy areas as well as woodlands. The Mount Hamilton thistle is a very rare plant found only in a few areas of California, including the Santa Clara Valley. It grows in moist, serpentine soil, especially near streams, springs of water, and other wet areas. 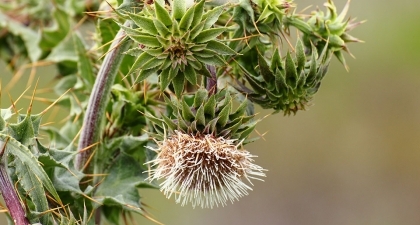 Like other thistle varieties, this plant has a thick, upright stem and has spiny-lobed or toothed leaves. The Mount Hamilton thistle’s white flowers have many thin petals and are perpetually nodding forward on their stalks. Its phyllaries, the leaf-like structures below the flower heads, are large and curved backwards. The Mount Hamilton thistle blooms from March through October. Lasthenia californica, or goldfields, earned its name by blanketing open spaces with a sea of its bright, buttery yellow flowers. Blooms usually peak from March to May. Goldfields can thrive in poor soils, including on the serpentine soils found in Coyote Ridge Open Space Preserve and along spring pools in the Sacramento Valley. It has reddish stems and the flowers extend 3 to 7 inches high. Goldfields can be pollinated by insects, including small flies and by native bees. Like many other native plants, goldfields faces threats from invasive species, development, and climate change: its splashy blooms depends on ample winter rains.